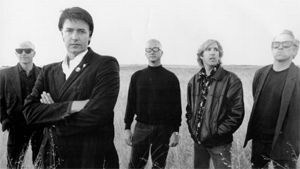 The Joykiller is a punk rock supergroup founded by Jack Grisham (vocals), Ron Emory (quitar), Billy Persons (bass), Chris Lagerborg (drums),and Ronnie King (keyboard) in 1995. Their latest offering is Music for Break-Ups. Maximum Ink: Do you happen to remember the moment when you first discovered the power of music? Jack Grisham: It was probably when I was a kid. There was trouble at home—alcoholism, strife, and detachment. I felt alone, uneasy, unloved, and then I heard Bob Dylan’s Lay Lady Lay and it gave me a warmth, a love, and a connection that I’d never felt. The song let me know that it would be okay. I remember copying the lyrics and pretending that I wrote them about she who would one day be in my life. MI: What was it like to start playing music at the age of 5? Do you think coming from a musical family offered you more encouragement to pursue your interests in the field? MI: What were you like as a child? Did you develop your love of music early on as well? JG: I was trouble, too smart for my own good and too sensitive to be comforted. I loved music but I wasn’t gifted as a singer and I had no discipline or desire to learn an instrument. MI: Who are some of your earliest influences? RK: I loved listing to Barry Manalow, and McCoy Jazz Great Piano Dude Chick Corea, and the music at the Catholic Church. JG: Frank Zappa and the Mothers, the Beatles, and the Rolling Stones. MI: Are there any fond memories from over the course of your career that you hold more dear than others? RK: I think signing with Epitaph Records was a highlight. Things were really exciting around there in 96. Oh and working at Death Row at the same time…and having Jerry Heller in the Life. JG: The travel and the connection with the audience. Playing music was the bridge to the hearts of those around me. It was a dear friend that stayed dear and never wavered. My connection with the audience was instant and close, like reminiscing with a stranger that you had never met, but you had so many shared feelings that it seemed like you always knew them. MI: When did you first know you were a musician? Do you think the job of a musician is more of a calling than a career choice? RK: I always knew I would play music. The job of music? It’s not a job it;s all about the music. JG: Playing music is not a choice. It’s painful to be filled with expression and it must be expelled. Whether its playing, writing, acting or any of the other arts, there are those that need to create—music just happens to be one of those necessary outlets. MI: How did The Joykiller come into being? Where does the name comes from? RK: I was playing with Jack in Tender Fury and Body’s and writing with Jack. Living at his mom’s house, living off my wife’s Mobil Card… I’ll let Jack tell ya the rest. JG: The name is an old slang term for a wife that rains on the errant husband’s parade; she was a “Joykiller”. It doesn’t really fit in our case but it was funny. As for how we came in to being; Ronnie and I were screwing around and I had an idea for a sound, a huge departure from what we’d been doing—a very difficult sort of jazzy pop show tune thing, and we stripped it down and simplified the groove. It was instant no-holds barred fun! MI: What has it been like to be in a band that is on again off again? JG: I’ve been married three times, on and off again seems fairly natural to me. MI: How would you describe the sound to those yet to hear it? RK: It sounds like water. I’ll leave it to the listener. MI: What can your fans expect from Music for Break-Ups? RK: A journey into sound. JG: A nice time, reminiscent of things you’ve heard before but twisted just enough to be new. Think of your lover, someone you’ve had history with, but tonight you come home and they’re wearing a new scent, a new nighty, or shirt, and it turns you on. You know them, but at the same time, they’re new, exciting, and a touch naughty. MI: Are there any little known things about you that our readers might be surprised to know? RK: They change every day. JG: I enjoy forest fires and humans that are not quite human. MI: What is next for The Joykiller? JG: Who knows? The beauty of this band is there is no plan. Spontaneity. JG: To do as you please and hopefully as you please contributes to our species and that of those around us. JG: If you see me, say hello. I like strangers, preferably with candy.